The STaR system can be used to specifically mark pre- or post-synaptic terminals using tagged brp or ort proteins, respectively. Tagged brp protein (tagged in the figure below with V5) is expressed following the removal of a FRT-flanked transcriptional stop cassette from a STaR construct. The FRT cassette can be removed in a specific subset of cells using either a cell-specific GAL4 with UAS-FLP or a cell-specific FLP construct. 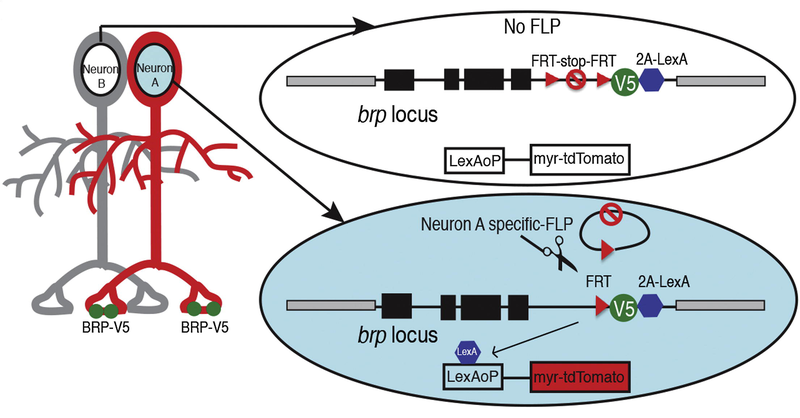 Tagged brp localizes to T-bars, cellular platforms for the assembly of presynaptic vesicles. Removal of the FRT cassette also results in the expression of LexA, which can activate fluor expression for visualizing the whole cell. The stocks listed below also provide constructs for tagging brp with GFP and for catalyzing the removal of the stop cassette using Recombinase SR instead of FLP. FLP recombinase can also be used to excise an FRT-flanked transcriptional stop cassette from another STaR construct to express the ort histamine-gated chloride channel, which is specific to postsynaptic termini, tagged with the OLLAS epitope. These methods were described in Chen et al, (2013). Cell-type-specific labeling of synapses in vivo through Synaptic Tagging with Recombination. Neuron 81: 280–293.